Non performing Loans (NPLs) are widespread in European countries, with the largest concentration of NPLs in Italy and the highest NPL ratios in Greece, as reported by Enria et al. in this issue and in Figure 1 of the Numbers section. In the European Union (EU), the stock of NPLs currently stands at about one trillion euros, and the average NPL ratio is at 5.1% of total loans. But the average hides massive differences across countries, with ratios ranging from 46% in Greece to 1% in Sweden, and with ten Member States reporting average NPL ratios of over 10% of total assets. NPLs generate risks of financial instability and constrain lending growth. What matters is not just the total amount of these assets, but also their distribution among more or less capitalized banks, larger and smaller banks. Even for countries with a low average NPL ratios, there is a very broad dispersion among individual institutions as shown in Figure 4 of the Numbers section and also Eurozone countries with low aggregate NPL ratios are affected by this problem. Finally, because of the integration of the European banking system, risks of spillovers and systemic events can be high across the whole region. This is, therefore, a European wide issue. A coordinated action to solve the problem of NPLs in Europe, involving State support when required, is necessary and doable. Some of the tools already in place or under discussion are market based, other require policy action and State support. They are all complementary and useful. And efforts to make them more effective and easily accessible should be made in all directions. Yet, and this is the bottom line of this editorial, we argue that the burden of non performing loans cannot be solved without setting up a coordinated effort of State backed asset management companies (AMCs). State intervention is required, beyond supporting policies to market instruments, because of the complex interaction between severe capital shortages in few institutions and market failures affecting the secondary market of distressed assets. This issue of European Economy reports and comments all the main proposals on the table: by representatives of key European and international institutions (ECB, EBA, IMF), although writing in their personal capacity, and by prominent academics. The proposals we discuss are not all alike, but they have many points in common, and when there is divergence, the gap to be bridged is pretty narrow. By combining these proposals, it is therefore possible to identify a meta proposal, encompassing common ingredients and viable compromises. As the European Commission is working on a blueprint for the setting up of coordinated asset management companies, we hope this meta proposal and all contributions to the issue will hopefully provide a useful background to the work of policy makers. A major concern that we raise in this editorial, is that more clarity would be needed in identifying the rationale for the use of State aid in this domain. The designs of many proposals superimpose the aim of recapitalizing banks with capital shortages that cannot be matched by the market with the aim of compensating market failures. State backed AMCs are normally seen as tools to deal with banks with capital shortages, potentially facing precautionary recapitalization or resolution: impaired assets measures are considered equivalent to direct capital injections. The architecture of the two proposals by Enria et al. and by Fell et al. in this issue is strictly nested in the framework of the Banking Recovery and Resolution Directive (BRRD) and of the Banking Communication on State Aid. This point is also discussed extensively in Galand et al. in this issue and in Council of the European Union (2017). And also the examples of AMCs set up during the Crisis, NAMA in Ireland, SAREB in Spain, DUTB in Germany and MARK in Hungary, follow this principle. Indeed, in the case of distressed banks, both capital shortages and market failures are especially severe. The price of NPLs would be depressed by the urgency of getting rid of them, in search for a rapid recovery. A quick disposal of these assets would generate large recapitalization requirements. Banks under stress might not be able to afford them or collect resources in the market. In this case there is a clear reinforcing loop between capital shortages and market failures, as further discussed below. Public intervention is grounded on both rationales. Yet, a large share of NPLs are held in the balance sheets of banks that would not face capital shortages under stress tests and would therefore not be allowed to benefit from State aid and the support of State backed AMCs (due to the lack of so-called “State-aid envelope”, as discussed below). These banks have clearly access to market instruments and must certainly use them: they can manage their NPLs through internal work outs, the recovery of collaterals and a gradual disposal through the market, via direct sales and trading platforms. However, market failures do exist for these banks too and they slow down the pace at which legacy assets are disposed of. In our view, market failures provide sufficient arguments for extending the access to State backed AMCs also to healthy banks, particularly until strictly market based instruments like trading platforms achieve sufficient scale and transparency. As this would also imply reducing the capital requirements of the beneficiary bank, a careful design of these AMCs should also in this case limit moral hazard through burden sharing with shareholders and potentially subordinated creditors. Avgouleas and Goodhart and Bruno et al. in this issue also share this view that part of the outstanding NPLs should be resolved with public support but outside a recovery and resolution framework. Naturally, a critical issue in this domain is identifying the real value of distressed assets and the adequate transfer price from banks to the vehicle. The array of tools to deal with NPLs under discussion, beyond state backed AMCs are many, as reported by Aiyar et al. , Fell at al., De Haas et al. in this issue1)See also the ECB’s last financial stability review (May 2017). Relevant proposals have also been implemented by the Vienna initiative for Central and Eastern European Countries, as reported by De Haas et al. in this issue: internal workout, asset protection schemes, NPL trading platforms, asset management, direct sales. 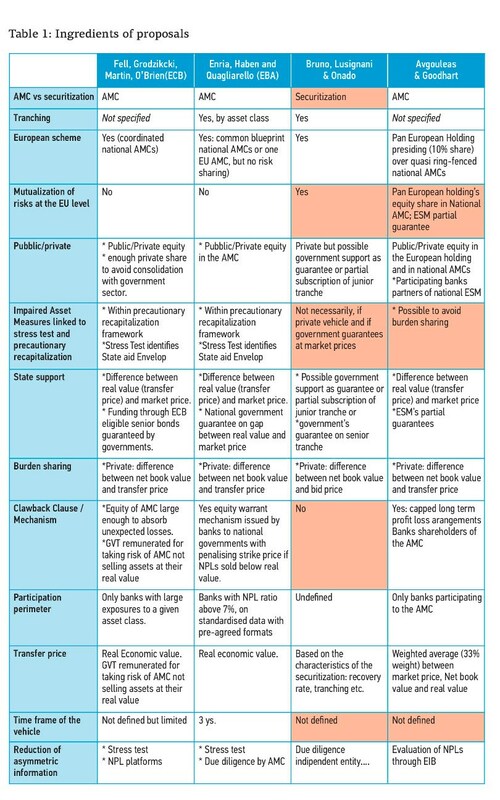 The activation of most of these tools requires policy actions, as clearly stated by Louri in this issue2)See also the recent report by the FSC Subgroup on non performing loans (Council of the European Union, 2017), prepared as a background document for the European Council. This is especially true in the case of measures such as enhanced supervision, structural reforms of insolvency and debt recovery frameworks, measures to favor the development of a secondary market3)Recovering the value of collateral can be quite expensive. According to the Doing Business survey, in Europe the average cost of insolvency is about 10% of the value of an estate. But there are large cross-country differences, with values ranging from over 20% in Italy, where judicial and administrative inefficiencies make the recovery process extremely burdensome, to less than 4% in the Netherlands.. This broad scenario of tools and institutions involved shows that there is a general and growing consensus on the need for a rapid disposal of the impaired assets’ backlog from banks’ balance sheets. And the European Council is fine tuning its master plan as we write. As argued, all tools are important and complementary and viable market solutions should be the main drivers of action. Yet as far as State support keeps being indispensable, it is essential that the definition of a common European blueprint for State backed AMCs keep being at the core of the European policy agenda. In what follows we discuss the main characteristics of the proposals in this issue highlighting their common ingredients (Section 2). We then discuss in detail the scope of State aid, between market failures and early recapitalization (Section 3), and how transfer prices to external entities such as an AMC can be defined (Section 4). Finally, we discuss a possible framework for a meta solution, based on the common ingredients of the proposals and on options on how to bridge their differences. We finally draw our conclusions. The proposals in this issue are 4, plus a contribution from Aiyar et al., at the IMF, outlining the broad framework required to deal with European NPLs. Two of the contributions, Enria et al. and Fell et al., are from representative of institutions, EBA and the ECB respectively, although writing in their personal capacity. Two are from prominent academics. Avgouleas and Goodhart is a refinement of an earlier contribution, published in the previous issue of European Economy (2016.2). Bruno et al. is a new proposal. All four contributions suggest setting up external vehicles dealing with NPLs, the first three through AMCs, the fourth one through a securitization vehicle. Of course, nothing prevents AMCs to securitize their assets, hence the two schemes can easily overlap. Table 1 below summarizes the main features of each of the proposals. Cells in yellow highlight positions where there is not full consensus among the proposals. For all four proposals, the mechanics works through the transfer of the impaired assets form the bank to the external vehicle at a higher price than the market price. The vehicle, which will be State supported, though in different ways, will then sell the assets to the market, after a period of gestation, possibly bridging the gap between the initial transfer price and the market price. All proposals share common underlying rationales and consequently several ingredients. The first element is market failure. All contributors agree that because of asymmetric information, uneven bargaining power between buyers and sellers, and the rapid disposal of legacy assets frequently required by regulators, there is a large gap between bid and ask prices for NPLs and also between the resulting market price and the real value of the assets. For this reason, all vehicles proposed have the specific aim of buying time (they all envisage long gestation periods, of at least three years), bridging the gap in market power between buyers and sellers, and reducing asymmetric information through impartial and accurate asset evaluations. All proposals also agree that public funding is required to reduce market failures, as far as compliant to State aid rules. So, all vehicles are mixed private/public endeavors. The second element is scale. Managing large amounts of NPLs requires enough scale to undertake a careful evaluation of the recoverability of these loans and enough market power to achieve effective and fair market transactions. Also, secondary markets are affected by first mover dis-advantage, in that at start they are not thick enough to attract sufficiently large number of investors at fair bid prices. For this reason, most proposals envisage the setting up of one national vehicle per member country. Enria et al., Avgouleas and Goodhart and Bruno et al. also discuss European wide schemes. The third one is European coordination. Even though there is large heterogeneity in the NPLs’ ratio across EU countries, they all have banks with large amounts of NPLs in their balance sheets, as shown by figure 4 in the Numbers section. Therefore, within the EU (or at least within the Banking Union), the conditions for the management and disposal of legacy assets should be harmonized as much as possible, as argued for example by Ayadi et al. in this issue. Consequently, all proposals have a EU or a Eurozone wide ingredient in their architecture. This ingredient may take a loose or a strong form. In the loose form, the proposals envisage highly coordinated national vehicles; in the strong form, a unique EU or Eurozone vehicle. The crucial discriminatory ingredient is the mutualisation of risks among Eurozone countries; in other words, whether the potential costs of the vehicles should be shared by all member countries or they should be borne only by the State and the investors of the country where the initial holder of legacy assets was based. Given the political resistance to risk sharing within the Eurozone, all the present proposals shy away from a strong form of coordination, thus only envisaging a form of coordination in mechanisms and rules, or limited mutualisation. Yet, as argued, Avgouleas and Goodhart, Bruno et al. and Enria et al. do consider a common European scheme, and Avgouleas and Goodhart also propose a certain amount of risk sharing. The fourth element is moral hazard. There is a need to keep skin in the game for banks disposing of their impaired assets, lest they could try to sell to the vehicle their worse assets, those less likely of recovery. Skin in the game might give selling banks also an upside option, in case assets are finally sold by the vehicles at a higher price than initially envisaged. All schemes discussed propose mechanisms of risk sharing between the vehicle and the selling bank, besides for Bruno et al. The fifth and last element is preserving financial stability. A rapid disposal of legacy assets at market prices by banks with limited capital buffers generate an immediate need for recapitalization, which might be difficult to achieve at market terms. The higher transfer prices offered by the vehicles proposed here would implicitly reduce the recapitalization requirements, and hence the risks of resolution or costly early intervention for ongoing institutions. These vehicles are also likely to reduce the costs to tax payers compared to direct recapitalisation. For this reason, these vehicles are of foremost importance for banks with shortages of capital. In the two proposals by Enria et al. and Fell et al. the vehicles are nested within the BRRD and the Banking Communication of 2013. Avgouleas and Goodhart and Bruno et al., instead, argue that these vehicles should also be available to viable banks, with no capital shortfalls under stress tests, a point that will be taken up again in Section 3. Finally, all vehicles are conceived so as to avoid the diabolic loop between banking and sovereign risk. For this reason, the share of public funding envisaged is limited, so as to avoid consolidation of the vehicles in States’ balance sheets. Only two of the proposals (Avgouleas and Goodhart and Bruno et al.) also suggest that a EU wide mutualized fiscal back stop would be necessary. These common elements identify a general framework for action, and essentially the broad ingredients that any scheme should bear. As the need for these ingredients is well accepted, then details are a matter of negotiation among the main institutional and political parties in the game. Yet the devil is in the details. The proposals reflect also different views on issues like the acceptable boundaries of state aid, the mechanisms for evaluating the real value of NPLs, the options for keeping banks’ skin the game, the extent of coordination and risk sharing among Eurozone countries. We will discuss these controversial points in the next two sections of this editorial, whereas in the last section we will conclude and make a meta proposal, also trying to suggesting ways of dealing with these critical issues. As clearly explained by Galand et al. in this issue, the amount of State aid granted by a State supported AMC is conventionally equal to the difference between the value of the asset at the transfer price paid to the bank and the value of the asset at market price. But under what circumstances can this State aid be granted, and how large could it be? In our view the framework which regulates whether and up to what extent an AMC can grant State aid combines different and possibly conflicting objectives, which may limit the scope of action of the AMCs.The proposals of State supported AMCs by Enria et al. and by Fell et al. in this issue are strictly anchored to a procedure of impaired asset measures and precautionary recapitalization, within article 32(4) of the BRRD and the Banking Communication of 2013. The report of the Subgroup on Non-Performing Loans (NPLs) of the Council’s Financial Services Committee (FSC) (Council of the European Union, 2017) sets similar policy guidelines. Within this framework, the total amount of State aid allowed is subject to two binding constraints. The first one is the so-called State aid Envelope and amounts to the capital shortage identified ex-ante by the stress scenario of a stress test or an asset quality review. The second constraint is that the transfer price paid to the bank cannot exceed what is defined as the “real value” of the impaired assets (except for exceptional cases in which, however, the bank must enter severe restructuring measures and the additional aid must be recovered a later stage, as for recital 41 of the Impaired Assets Communication notes). Hence, if for example the value of the eligible transfer made by the AMC to the bank under the second constraint exceeds the State Aid Envelop under the first constraint, the transfer price must be lowered accordingly. In practice, it can be even annihilated, meaning that there is no room for a bank to sell its NPLs to the AMC at a price higher than the market price. The implication of this double constraint is that banks that result having no capital shortages under a stress test, and which are not eligible for precautionary recapitalization (because they are healthy enough, not because they are moribund), cannot sell their impaired assets to State supported AMCs. Given that a large share of the NPLs is held by these banks, the scope of AMCs will be pretty limited. The problem is that the arguments justifying the use of State aid, on the one hand, and the setting of the two constraints, on the other, are not necessarily the same. State aid under precautionary recapitalization is strictly justified by the need to provide capital to viable banks that cannot find it on the market, so as to avoid systemic disruptions. State aid granted by AMCs is justified also, if not mainly, by the presence of market failures that depress the market price of NPLs. Certainly, a higher transfer price than the market price reduces the capital shortages of the selling bank. Hence, asset impairments measures are equivalent to capital injections. However, market failures affect also viable banks with no apparent capital shortages, burdening their balance sheets. The market failures argument underlines the policy objectives of coordinated State-supported AMCs in Council of the European Union (2017): bridge intertemporal valuation gaps, create critical mass of expertise to evaluate loan portfolios and reduce symmetric information, help smaller lender entering secondary markets. Also, the procedure utilized by DG Competition to identify the real value of legacy assets, clearly explained by Galand et al. in this issue, is itself grounded on the principle of identifying the extent of market failures, as we further discuss below. So, if the rationale for setting a transfer price higher than a market price is essentially grounded on the presence of market failures, why banks with sufficient capital should be restricted from using these vehicles? Procedures already in place at DG Comp to identify the real value of assets and described by Galand et al in this issue could be applied anyway to avoid setting prices above real values. Moral hazard issues would be dealt with anyway, since the difference between the net book value and the transfer price of the assets would be covered by the capital of the bank, perhaps even by converting subordinated credit or by raising fresh capital in the market. Also, claw-back clauses could apply anyway, and most likely the skin in the game would even be larger for well capitalized banks, that have no incentives to “run for resurrection”. Yet we do not find good reasons to subject these banks to all the other restrictions and conditionality affecting institutions in early recapitalization: limits to the distribution of assets, sever assessments on market competition and so on. All these conditions would likely shy these banks away from using state funded AMCs. One may argue that market failures are lower in the case of viable banks which are not forced to dispose of their assets rapidly, or which are large enough to carry out adequate internal work outs. However, for viable banks as well there would be issues of asymmetric information and evaluation of assets that would be eased by AMCs. Also, there is a question of market size, that cannot be sorted out at market terms. In other words, in early stages, secondary markets for NPLs would not be large enough to likely kick start a real disposal of these assets without State support. Large State supported AMCs, coordinated at the European level, would certainly help creating a critical mass of these assets and developing sufficient scale and expertise to deal with large stocks of NPLs. In this framework, as the market grows, market imperfection would be at least partially overcome, and the market price would gradually converge to the real value. Once this process is completed, then State aid would be less necessary, and could be restricted just to the needs of distressed banks. Summing up, a coordinated effort of State supported AMCs in Europe is justified and should be implemented independently from precautionary recapitalization procedures. It should be accessible both to banks under recovery procedures and banks with sufficient capital buffers. As anticipated above, markets for NPLs may come to a halt, with the price buyers are ready to pay, the Bid price, significantly and steadily lower than the sellers’ Ask-price. The impediments underlying the bid-ask spread are typically the superior information sellers have with respect to buyers (adverse selection), the coordination issue inducing a first mover dis-advantage in a price discovery process and illiquid markets, and the risk for weak banks (and for the stability of the entire sector) of failing to attract capitals to recapitalize the losses of selling NPLs below their book value. As discussed at length in the contributions of this Issue, a market for NPLs cannot develop because the Bid-price (often named the market value) is systematically below the price banks currently want to realize when selling their NPLs, i.e. the Ask price. This difference generates a bid-ask gap that in many European countries is estimated up to 20-30%. Prices, bid and ask, are based on market participants’ estimated economic value of the NPL, which accounts for the underlying expected returns of the asset over the relevant time horizon (the “fundamentals” of the asset), and also accounts for its present and future scarcity. In normal times, transactions occur when these estimates differ for the two sides of the market. The actual transaction price then depends on these estimates, on the market mechanism, and the bargaining power of the selling and buying sides. In presence of significant market failures, however, buyers’ estimated economic value is depressed, and transactions are rare or absent. When transferring an NPL to an AMC, a transfer price needs to be determined, independently of market evaluations and transactions, at a level typically higher than the Bid price, so as to generate the relief effect on the bank’s balance sheet. The difficulty of dealing with transfer pricing is that these prices do not reflect market transactions, and as such tend to be based on judgmental evaluations. This is relevant because a transfer price of a NPL implicitly defines a subsidy from the AMC to the selling bank, with respect to a hypothetical market transaction. As we have seen above, this subsidy becomes a State aid when the AMC is publicly backed. The actual state aid per transaction is in fact defined by the European Commission as the difference between the transfer price and the market value (i.e. the Bid price, as explained above). The Commission also states that the transfer price cannot be higher than the real economic value of the NPL, i.e. the best estimate of the “underlying long-term economic value of the assets, on the basis of underlying cash flows and broader time horizons”. Operationally, this is the estimated present value of future cash flows generated by the assets, net of workout costs and discounted at an interest rate that includes a risk premium for normal times. In principle, the real economic value is a relevant benchmark, because if a bank granted a loan with a real economic value much lower than the market value, then it would be making an obvious mistake. And, clearly, we do not want that a generous transfer price relieves the bank with aids, and covers losses of obvious and foreseeable errors. Finally, if we look at banks’ books, loans are accounted with their nominal or gross-book value and, if any write-off already occurred, at a lower net-book value, which is the gross book value net of possible accounted provisions. This long list of different prices and values clarifies that valuing and transferring an NPL in distressed times is a difficult task. This is because the market does not properly function and NPLs do not efficiently trade. Surrogating the market is difficult and requires a complex toolbox of prices and values. This situation is not unique to NPLs. When related parties, such as for example companies of the same holding group, exchange goods and services, they use a transfer price for these non-market transactions. The value of this price has several consequences, that are also relevant outside the group. For example, a high transfer price may allow to shift profits across companies and across countries. Several approaches have been internationally developed to address this problem, mainly for fiscal reasons, based on the general idea of replicating as close as possible arms’ length transactions. A first group of methods is based on information concerning the single specific transaction and can rely either on prices charged for comparable transactions, or on cost-plus methods. In the latter case, the transfer price is the estimated per-unit cost of production plus a fixed mark-up typical for the industry. A second group of methods considers the fact that in several cases (e.g. when licensing intangible intellectual property rights) comparable transactions do not exist and specific cost estimates are simply not available. These non-transactional methods (also identified as profit-based methods) instead rely on acceptable and comparable measures of overall profitability that are subsequently applied to specific transactions. If possible, the issue with NPL is even more complicate than that of transfer pricing between related entities, because of the pervasive impact of market failures. But the logic is similar. Consider, for example, the case of the Hungarian AMC named MARK, that in 2016 acquired assets and NPLs under the condition that they were collateralized with real estate. When available, reliable information about cash flows was used in an “income model”, replicating the idea of determining the real economic value with an appropriate implicit cost of capital (in the range of 7-15%). Alternatively, prices were used for transactions of similar real estates. These estimates of MARK where then double checked by independent external valuators. Then, a second stage followed to calculate the market values of each loan backed by these real estates, applying an appropriate discount to the estimated real economic value, to finally obtain the transfer price of the NPL. These are relatively simple cases, because they refer to assets backed by real estates. Clearly, valuing an operating loan to a SME, for example, would be much more complicated, precisely because these loans are unique: no comparable transactions exist and an “income model” would require a lot of information that, if anything, only the entrepreneur may possess and properly judge. Note that the ECB (Constâncio, 2017) recently reported that 36 per cent of gross NPLs is covered with collaterals, so that a large fraction of NPLs is potentially non-standard. In this quest of the “right” and state-aid-free transfer price for non-standard loans, market mechanisms such auctions are also of very limited help. Although auctions can be very efficient mechanisms, here they could at best reduce buyers’ bargaining power and make emerge the economic value of buyers or of sellers (using reverse auctions), that would remain respectively unduly depressed and overvalued, due to market failures. With non-standard and non-comparable assets, we think one should accept the fact that other approaches should be used to determine a transfer price (or other mechanisms of public intervention). As in the case of transfer pricing rules for taxing purposes, when the type of NPL and the associated collateral are non-standard, simple profitability approaches should be considered, where some level of acceptable profitability for the buyer and loss for the selling bank are identified. The proposal of Avgouleas and Goodhart in this Issue is in part related to this idea. They suggest to transfer these “special” NPLs to the AMC at a transfer price that is the weighted average accounting for the Net-book value with a 1/3 weight. Also Bruno et al.’s proposal in this Issue relies on a transfer price anchored to the expected recovery rate of the selling bank’s loans and adding, to that recovery rate, a buffer granting enough profitability to the buyer and sufficient relief to the seller. The fact that the “best guess” is unbiased requires to take care adequately of possible moral hazard problems. When considering the more problematic class of non-standard NPLs, banks have strong incentives to cherry-pick their best assets for themselves and for future transactions. To avoid this strategic behavior, the profitability approaches for transfer pricing should therefore be associated with a random identification of the NPLs to trade at different points in time. As previously discussed, a critical issue is that there is a tendency for good assets owners to wait for hopefully higher future prices and, conversely, for low quality assets owners to populate the market immediately. This adverse mix clearly depresses buyers’ expectations and increases the bid-ask gap. Although they have not yet been discussed in this framework, other types of temporary interventions in the functioning of a secondary market for NPLs may help jumpstarting the market and restore confidence and liquidity. For example, it might be possible to organize a policy of current trade subsidies and future trade taxes on NPL transactions, with effects similar to a purchase at prices higher than the market price, with a claw-back clause case of overpricing. This would affect the perverse intertemporal trade-off described above, reducing the bid-ask gap, increasing exchange prices, and eventually inducing even more trade4)Several recent papers (Philippon and Skreta 2012, Tirole 2012, Fuchs and Skrzypacz 2013) have clarified how these types of intervention may be very effective by tampering the bid-ask gap also intertemporally..
All the proposals described above originate from the view that, in the current situation, a private solution to the problem of bank non-performing loans is not sufficient, due to the large number of market failures that prevent the determination of a fair price at which banks can sell these assets to outside investors. But each proposal also has its distinctive features and stresses some specific aspects that may be overlooked by others. It is therefore interesting to find what the common denominator among the different proposals is. Further, by making some preferential choices when some aspects are conflicting, we develop a meta-proposal, the meta AMC, that possibly encompasses all the strengths of each single approach. This discussion is useful as the European Council is launching its project for defining the blueprint of national European AMCs. A first aspect that is common across most of the proposals is the establishment of an AMC, mainly due to the positive experiences of the past, both within the European Union (e.g., in Ireland, Spain, Slovenia, Hungary) and in the rest of the world, most notably in Japan around the beginning of the new millennium. While other solutions have been suggested by some authors, none of them is fully in conflict with this hypothesis, that we therefore also take as the building block of our meta-proposal. The second step is the degree of involvement of the banks, the initial owners of NPLs in the AMC. All proposals have in common the view that to address moral hazard it is necessary that banks share at least in part the potential losses that an AMC might face. However, this can be achieved in different forms, for example through a mandatory participation in the capital of the AMC by part of all banks that want to sell their NPLs to the company; or through different claw-back clauses in case of excessive losses on the value of the assets that are transferred. While both mechanisms introduce a relevant degree of uncertainty in the participating banks’ value, that may harm their ability to fund normal activities after the removal of the NPLs, this uncertainty is higher in the case of direct claw-back clauses than with participation in the capital of the AMC, since the latter entails a mutualization of risk among the funding banks. On the other hand, full mutualization may cause both adverse selection and moral hazard problems, because only banks in very bad situations would take part to the scheme, possibly selling only their worst NPLs. For this reason, without taking a precise position on the relative weights, we advocate a mixed solution of partial cost and benefit sharing: if after a given time frame the price of the NPLs does not converge to the transfer price, the losses of the AMC are supported partly by the bank that has sold them, so as to limit moral hazard and adverse selection, and partly by all other banks, in proportion to the amount of NPLs that they have sold to the AMC. Such mechanism could be made symmetric, at least in part, allowing for a partial mutualization of the upside, in case assets are finally sold at a price higher than the transfer price. Aside from issues of fairness, such a mechanism would have the benefit of increasing banks’ incentives to participate in the scheme, as suggested by De Haas et al. The third crucial aspect is the role of the State. While positions are more nuanced in this respect, we believe that at this initial stage an AMC cannot work if the State does not provide financial support. This can either take the form of an equity stake in the capital of the company or some form or external guarantee. Since it is likely that the AMC will have to take some discretional management decisions before the value of the NPLs will be fully realized, we believe that it is better to allow for a direct participation in its governance. For this reason, we prefer that the State takes an equity stake in the capital of the AMC and be adequately represented in its board, rather than that it just provideing an external guarantee. Since it is of foremost importance that an AMC operates with a relatively high leverage, by raising substantial funding from the market, additional forms of public involvement can take either the form of a State guarantee on the senior liabilities issued, or that of a State guarantee on the value of some classes of NPLs. An interesting additional option might be for the AMC to securitize its assets in different risk tranches, and sell them to external investors, as also envisaged in Bruno et al.’s proposal. When adequately organized and priced, the benefits of pooling, tranching and securitizing assets have been fully recognized in the academic literature (see, e.g., De Marzo, 2004), and indeed many initiatives have been proposed to restart a market for asset backed securities, including by the European Commission. Forcing banks participating in the AMC to acquire the equity tranches of the securitizations and requiring the State to provide a public guarantee to the most senior tranches might obtain the double benefit of reducing moral hazard by banks and enhancing the liquidity of the less risky asset classes. Securitization might also have the advantage of making the pricing of the underlying NPLs easier. A fourth aspect – that in the debate looks a bit like the Stone’s Guest in Mozart’s Don Giovanni – is whether there should be some degree of public mutualization of the potential costs of an AMC at the European level. The problem is that the lack of mutualization might trigger a diabolic loop between State and banks risk if the AMC faces large losses and an issue of sustainability of sovereigns arises. While we share the view that it is of foremost importance to envisage a mechanism to limit moral hazard at the country level, we also believe that some degree of mutualization of the risks of an NPL crisis at the European level is necessary and beneficial. In this sense, we endorse the proposal of Avgouleas and Goodhart of a two-tier equity and governance structure, with a European-level AMC that holds limited equity stakes in each national AMC. Indeed, this structure would not conflict with the other ingredients discussed so far. While all the features presented above could be maintained at the level of single country’s AMCs, such a structure would engineer ex-ante a framework capable of addressing the contingency that a national AMC turns unsustainable. One option would be for example to foresee a conditional intervention of the ESM. We understand that at this stage mutualization is politically very unlikely to be feasible. So in the immediate, all other ingredients could start being implemented, with a longer term prospect of discussing and engineering such a mutualization at a second stage. In addition to these fundamental aspects, a set of relevant details are discussed in the different proposals, ranging from the perimeter of assets that should be considered for a potential transfer to an ACM, to their transfer prices, to what banks should take part in the initiative. With respect to the first issue, a consensus seems to emerge from the different proposals that the only NPLs that should be considered are those for which a common management outside of the perimeter of the bank increases their economic value. Clearly, these include standardized loans, possibly guaranteed by external collateral, such as house mortgages and consumer credit loans. However, given the size and the sector distribution of NPLs in some countries, it is important to recognize that also more opaque expositions such as loans to corporations must be considered. This is possible using transfer prices identified along the lines discussed in detail in Section 4, possibly with the certification of the EIB, as suggested by Avgouleas and Goodhart. Finally, with respect to the perimeter of banks that should take part in the initiative, costs and benefits of the different options should be considered. Allowing banks to participate on a voluntary basis might cause adverse selection problems, since banks that think that they can oversell their NPLs would have stronger incentives to participate. On the other hand, forcing all banks to adhere to the AMC might cause moral hazard problems, and impose unwarranted costs to those financial intermediaries that in the past had sounder lending policies. However, considering the disincentives to moral hazard strategies discussed above and the benefits of making as large and liquid a market for NPLs related assets as possible, we do believe that all banks should be forced to contribute to an ACM, at least in part and in the initial period. Aiyar,S., Bergthaler, W., Garrido, J.M., Ilyina, A., Jobst, A., Kang, K., Kovtun, D., Liu, Y., Monaghan, D., and Moretti, M. (2017). A strategy for resolving Europe’s problem loan. European Economy – Banks, Regulation, and the Real Sector, this issue.Avgouleas, E., and Goodhart, C. (2017). Utilizing AMCs to tackle the Eurozone’s legacy non-performing loans. European Economy – Banks, Regulation, and the Real Sector, this issue.Ayadi, R., Ferri, G., and Lastra, R.M. (2017). Systemic solutions to systemic crises. dealing with NPLs in the Eurozone. European Economy – Banks, Regulation, and the Real Sector, this issue.Bruno, B., Lusignani, G., and Onado, M. (2017). Why we need to breach the taboos on European banks’ non-performing loans. European Economy – Banks, Regulation, and the Real Sector, this issue.Council of the European Commission (2017). Report of the FSC Subgroup on non-performing loans. General Secretariat of the Council. Available at: http://data.consilium.europa.eu/doc/document/ST-9854-2017-INIT/en/pdfDe Marzo, P. M. (2005). The pooling and tranching of securities: a model of informed intermediation. Review of Financial Studies, 18, 1–35.Enria, A., Haben, P., and Quagliariello, M. (2017). Completing the repair of the EU banking sector- A critical review of an EU Asset Management CompanyEuropean Central Bank (2017). Euro area financial institutions. Financial Stability Review, May 2017.Fell, J., Grodzicki, M., Martin, R., and O’Brien, E. (2017). A Role for systemic Asset Management Companies in solving Europe’s non-performing loan problems. European Economy – Banks, Regulation, and the Real Sector, this issue.Fuchs, William and Andrzej Skrzypacz (2013) “Costs and Benefits of Dynamic Trading in a Lemons Market” Stanford GSB Research Paper Series # 2133. August 2013.Galand, C., Dutillieux, W., and Vallyon, E. (2017). Non-performing loans and State aid rules. European Economy – Banks, Regulation, and the Real Sector, this issue. Philippon, Thomas and Skreta, Vasiliki (2012) Optimal Interventions in Markets with Adverse Selection, American Economic Review, 102 (1), pp. 1-28. Tirole, Jean (2012) Overcoming Adverse Selection: How Public Intervention Can Restore Market Functioning. American Economic Review, 102 pp. 19-59. 3. ↑ Recovering the value of collateral can be quite expensive. According to the Doing Business survey, in Europe the average cost of insolvency is about 10% of the value of an estate. But there are large cross-country differences, with values ranging from over 20% in Italy, where judicial and administrative inefficiencies make the recovery process extremely burdensome, to less than 4% in the Netherlands. 4. ↑ Several recent papers (Philippon and Skreta 2012, Tirole 2012, Fuchs and Skrzypacz 2013) have clarified how these types of intervention may be very effective by tampering the bid-ask gap also intertemporally.